If we could only use one characteristic to describe equity market performance so far in 2019, late day strength may be the most applicable. Heading into Monday, the S&P 500 had been up in the final hour of trading for seven straight days, and over the prior five weeks, the last hour of trading saw positive returns 90% of the time! That kind of late day strength doesn’t occur all that often. Ever since the S&P 500’s most recent low on December 24th, the intraday trading characteristics of the market have really shifted. 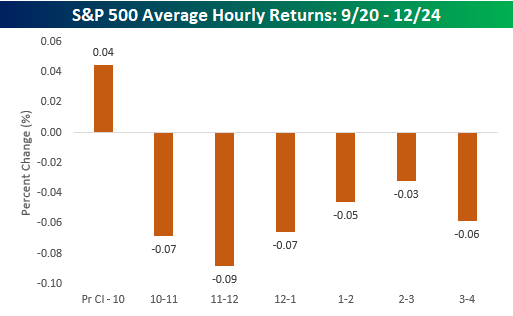 The first chart below shows the S&P 500’s average hourly performance during the period from the 9/20/18 high through 12/24. The only time period of the day that saw any strength was the opening half hour. From 10 AM on, though, every other hour of the trading day averaged a decline, with the most weakness coming from 10 AM through 1 PM. The last hour of the trading day wasn’t particularly strong with an average decline of 0.06%. 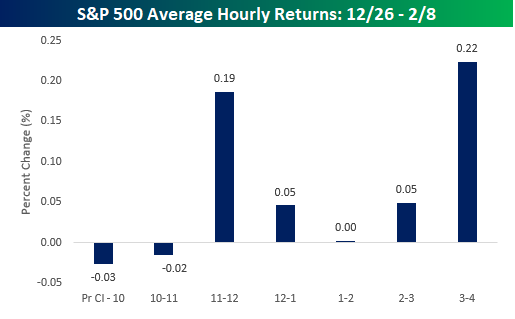 In the period since Christmas Eve, the intraday characteristics of the trading day have been completely upended. During this period, the weakest part of the trading day has been the opening half hour (formerly the strongest), while the strongest part of the trading day has been the last hour with an average change of 0.22%. Behind the last hour of the trading day, the next strongest hourly interval has been the period from 11 – 12, which has averaged a gain of 0.19%. Combined, these two hours of the trading day have accounted for 86% of the S&P 500’s gains since the Christmas Eve low. Moral of the story? If you are a bull these days, don’t take an early lunch and don’t try and cut out early to beat the traffic home!